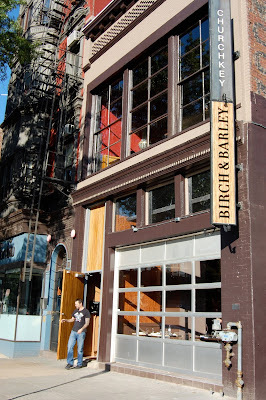 Attention brunch lovers: 14th Street hot spot Birch & Barley will serve its first Sunday brunch Feb. 28. And even better? The new Sunday brunch will be served all day from 11 a.m. to 8 p.m. Chef Kyle Bailey will be cooking up fried chicken and waffles, corned beef hash with fried duck eggs, whiskey-vanilla french toast with caramelized apples and sour cream, and truffled croque madame with Canadian bacon. Morning sweets are in the capable hands of pastry chef Tiffany MacIsaac, who'll be turning out freshly fried donuts, sticky buns with brown sugar toffee and pecans, and a bread basket with carrot-zucchini muffins, banana coffee cake and cinnamon-raisin bread. Also helping make your weekends taste better, ChurchKey is now open for lunch starting at noon on Saturday and Sunday. On the menu: new additions like a Cubano panini and a cheese flatbread featuring Red Apron artisanal pepperoni, and menu standbys including the fig and prosciutto flatbread, mac and cheese sticks and the fabulous brat burger. Nathan Anda of Red Apron makes some fine fine charcuterie. If you haven't seen his full array at Penn Qtr Thursday market, you need to hustle down there come April. The cured meats are awesome, ciccioli is baller, legitimately the greatest hot dogs you have ever had. Sorry Vienna beef and Nathan's New York fans, your dogs don't compare. Also he makes a version of corned beef that is like reconstituted in some clever way, although that makes it sounds nasty when in fact it is extremely delicious. Good news. I love me some morning food, but I sure hate mornings. Hmmm..too bad the brunch menu link on their site is broken. do you get a slab of applewood with the $5 bacon?